America Achieves Educator Networks collaborates with schools across the nation and the globe to learn about, advance, and share promising practices to improve career readiness and life success. 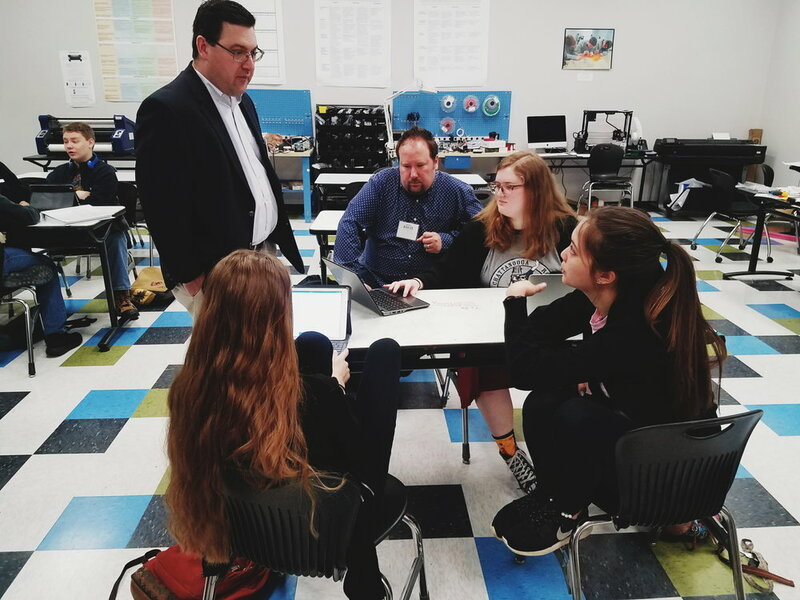 In April 2018, our team visited STEM School Chattanooga with other school and district leaders to learn how this public high school is taking project-based learning to the next level by explicitly designing projects to develop specific, career-ready, cross-sector competencies and leveraging Gold Standard criteria for designing project-based learning (PBL). As defined by the Buck Institute for Education, Gold Standard PBL puts student learning at the center and includes essential design project elements such as student voice and choice and authenticity. In this profile, we share what the STEM School is doing to ensure all students are prepared for life after high school. When you walk into STEM School Chattanooga, located in southeastern Tennessee, several things immediately catch your eye: the Myers-Brigg poster with a Star Wars Character for each personality type. The classroom walls that don’t reach to the ceiling and don’t have doors, giving the building an open and spacious feel. The rubrics on display that include the definition of a skill (e.g., Critical Thinking is both the capacity to combine or synthesize existing ideas, images, or expertise in original ways…) as well as the benchmark, milestone, and capstone for the development of that skill. The colorful “FabLab” with projects in various stages of development. The inspirational quotes decorating the hallways (“One man’s magic is another man’s engineering.”). The open access to a nearby college campus, where students can work towards associate’s degrees. Many of the classrooms at the STEM School are set up in a way that reflects the school's values: transparent, accessible, and student-centered. STEM School Chattanooga is a public 9-12 grades high school, though there’s potential for lower grades to be added in the future. It was founded in 2012 with 75 students and now includes 263 students from all over the district who are admitted to the school through an open lottery. Since its inception, the STEM School has established itself as a model school aimed to provide a project- and problem-based learning curriculum aligned with Tennessee's state standards. The school specifically focuses on sciences, technology, engineering, mathematics, and the arts. 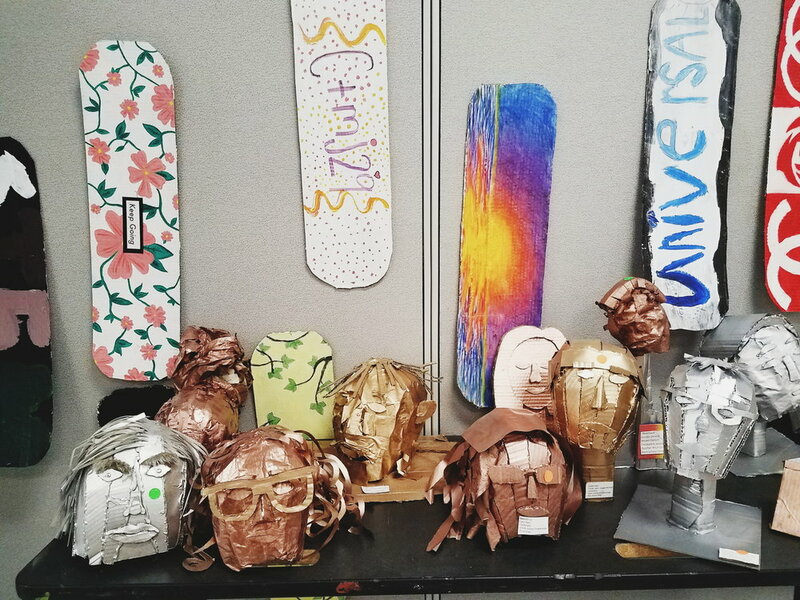 According to the school's website, "Strong related arts programs and advanced technological resources will foster creativity and innovative critical thinking skills as they address the project challenges presented in school curriculum." The STEM School hopes to push its practices out to other districts to support students in authentic project-based learning that will help them develop the skills needed for success beyond high school. 100% of students at STEM Chattanooga are enrolled in college-level courses and complete a yearly project in collaboration with community businesses and organizations. In 2018, STEM School Chattanooga was among 15 schools to receive the first Tennessee STEM School designation and was recognized as having a perfect score during the application process. “Gold Standard” project-based learning is the comprehensive, research-based model created by the Buck Institute for Education to ensure that student learning remains at the forefront. According to this model, Gold Standard project-based learning must include student learning of academic content and skill development at the center, essential design project elements (outlined in detailed on their website, linked above), and project-based teaching practices. STEM School Chattanooga aligns its project-based learning initiatives with many of the elements of the Gold Standard. STEM School students give visitors a tour of the school's FabLab. Throughout the various components of the school, STEM School Chattanooga keeps its goal for project-based learning front and center: an industry-aligned model that intentionally develops the cross-sector competencies critical for career and life success. Content-knowledge acquisition through project-based learning is highly valued, and “process skills are the number one priority,” says Donen. These skills (referred to as “process skills” by the STEM School and as “cross-sector competencies” by the Educator Networks) include collaboration, critical thinking, and innovation - the three tenets of the STEM School. As the world becomes more and more connected, learning to work effectively with a diverse group of people is an increasingly important skill, both personally and professionally. The STEM School helps students develop this ability by having students assess their personalities using Myers-Brigg, and then purposefully grouping them with peers of distinctly different personalities and guiding them to successfully communicate, collaborate, and build empathy and understanding. STEM School Chattanooga’s curriculum is rooted in a project-based learning philosophy. The PBL units extend throughout the school year, with each grade level experiencing a deepened focus as students progress through their high school career. Because of their project-based nature, unit plans at the school are cross-curricular; unit templates are designed to support this and foster teacher collaboration. The units are set up to support students in mastering content standards as well as process skills. All unit plans and corresponding rubrics are available on the school’s website and are designed to be transparent to students, families, and community partners. The FabLab is a space where students can design, prototype, and test products of their yearly projects. The goal is for each student to achieve mastery in each learning target, and so grades at the STEM School are improvable. According to the school’s website, “If a student earns a grade of Basic on a particular learning target, that student can improve that grade if they are able to demonstrate a higher level of mastery. In order to do so, the student is responsible to seek out the teacher and devise a plan to improve. Every day, students will have time each day during an extended lunch time to access any teacher in the school.” Through this structure, students have increased agency in their learning. They can see where they stand and how they need to grow using the rubrics, strategically plan to improve their understanding with the support of teachers and peers, and revise and evaluate to reach their learning goals. The FabLab, short for fabrication laboratory, is a space within STEM School Chattanooga where students can design, prototype, and test products of their yearly projects. Students gain hands-on experience and develop expertise in technology-focused tools (including computers, 3D printers, electronics workbenches, digital fabrication tools, and traditional wood shop tools) as well as develop 21st century competencies like collaboration, communication, and critical thinking. STEM School students have used the FabLab to support projects like fabricating solar array panels for outdoor classrooms, making an Arduino-based electronic garden monitoring system, and inventing a charging device for smartphones powered by swinging a door. The student-centered model is another way that STEM School Chattanooga fosters the development of process skills. Within the classrooms at the STEM School, students develop self-sufficiency by identifying what they need to work on and completing PBL tasks at a pace that makes sense for their project. By setting up a school structure (see a sample schedule here) that offers students independence, opportunities to explore their interests, meaningful practice in resource and project management, and ownership of their learning environment, the STEM School prepares students for careers that prioritize autonomy and being creative problem-solvers. Students collaborate on the design of a new city park. By the time STEM School students reach the 12th grade, the problems to drive projects are no longer created by teachers or other adult partners. Students are tasked with defining a STEM-related problem and designing a solution. According to the unit plan, in order to successfully complete their projects, they have to network with professionals (Collaboration - Networking), apply expert and professional knowledge in solution development (Critical Thinking - Expert Knowledge), and use creative thinking to create something new and valuable (Innovation - Invent). The partnerships the STEM School maintains with businesses and community organizations are critical for project success. As Buck Institute’s Larmer and colleagues describe, “Authenticity is a complex concept, but it’s generally synonymous with making a learning experience as ‘real’ as possible.” STEM School Chattanooga emphasizes authenticity by connecting project-based learning to life beyond the classroom and creating projects that identify problems that pertain to local business and community needs. Each year that they are in school, STEM School students complete one or multiple PBL projects. These projects generally require students to take their learning beyond the four walls of the school and connect with local organizations or businesses. Through these projects, students have the opportunity to explore relevant issues. Rubrics and unit plans are displayed throughout the school. Projects in grades 9-11 are designed through teachers collaborating across subjects and connecting with industry and community partners. For example, an 11th grade PBL unit plan that emphasizes collaboration asks students to “conduct market research and prepare a user needs analysis for use of highly automated vehicles in Chattanooga.” Community and business partners in this unit include representatives from Global Institute for Urban Mobility and Urban Planning, UTC Department of Mechanical Engineering, and CARTA. According to the unit overview, “For the school partner, the focus is on capturing user needs in Chattanooga of potential users from all walks of life to support development of the Flywheels HAV (highly automated vehicle) concept. For the STEM School, the focus is on the collaboration and critical thinking skills demonstrated by the student teams.” At the conclusion of the unit, teams of students present the results of their market research and user needs analysis for HAVs in Chattanooga. They are assessed using the Chattanooga State Community College rubric for Collaborative Skills and the Association of American Colleges and Universities rubric for Critical Thinking Skills. Students are able to learn from leaders in business and higher education, and understand how what they learn at the STEM School will be relevant in their careers and lives. By working on community projects with real impact (for example, helping to design a new public park), students feel deeper connection, ownership, and pride. At the conclusion of their projects, students create a public product that they present to their community. The school views project-based learning not as the “main thing,” but as an effective tool to help students have authentic experiences that prepare them for career and life success. As STEM School Chattanooga continues to grow and evolve, the staff reflects on the lessons learned, including the importance building a clear vision, communicating a case for “why,” developing students’ skills to engage in PBL, and ensuring teacher buy-in. A teacher at STEM School Chattanooga offers insights and support to students on their group project. STEM Chattanooga places high value on thinking outside the box and trusting the process. However, the staff notes, these things only work if time is taken to develop a culture that supports the effective implementation of PBL. The school has come to understand that in order to foster creativity and innovation, significant work needs to be done in the beginning. This helps to create a strong school community through maintaining and sharing identity. A sense of belonging, ownership, and pride comes from coalescing around the common vision. Tangible elements that support the STEM School’s vision include strong mission and vision statements, the three tenets of the school’s four-year plan, shared rubrics, cross-curricular unit plans, and school-wide learning targets. Communicate a case for “why"
The STEM School often hosts visitors, and encourages guests to talk with students to learn more about the school. Teachers as leaders are encouraged and valued at STEM School Chattanooga. The school found that the practice of developing teachers as leaders is most effective when the teachers who are excited and on-board with the innovative new practices are the ones who are engaged first. These teachers become champions - bringing in new ideas, supporting other teachers, and reaching out to businesses and community organizations to form partnerships. STEM School Chattanooga is currently working to create stronger coherence and scaffolding across grade levels, so that each grade expands on the previous one. Working towards this vision, the school is beginning with the end in mind - asking what a quality senior capstone project looks like, and then planning backwards to ninth grade. Another initiative the school hopes to expand on is deepening the assessment of quality project-based learning. The STEM School puts forward the question: how can the true value, in addition to the mechanics, of project-based learning be assessed?